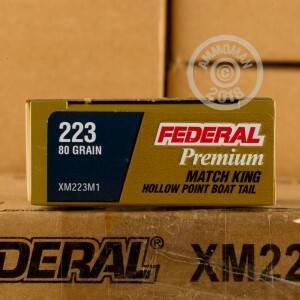 This is .223 Rem Federal 80 Grain Match King Hollow Point Boat Tail ammo. The MatchKing line is known for accuracy and consistency. This ammo can only be used in single shot, throated barrels. This ammunition features an 80 grain Hollow Point Boat Tail Sierra MatchKing bullet. The MatchKing bullets have a boat tail shape to minimize drag and improve ballistic coefficient. Boat tail bullets are also less sensitive to crosswinds and retain higher velocities downrange than flat base bullets. The accuracy of MatchKing bullets is world-renowned and have been used in more competition wins than any other target bullet manufacturer. 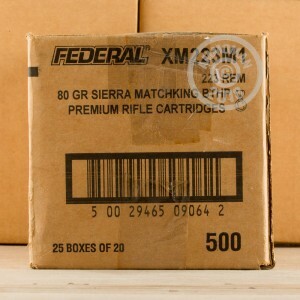 Federal manufactured this ammunition for the United States military originally. The cartridges have reloadable brass cases and boxer primers. 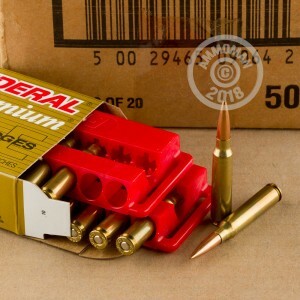 Pick up a case of premium rounds and get free shipping!